If you are unfamiliar with the Nintendo DS, let me enlighten you. 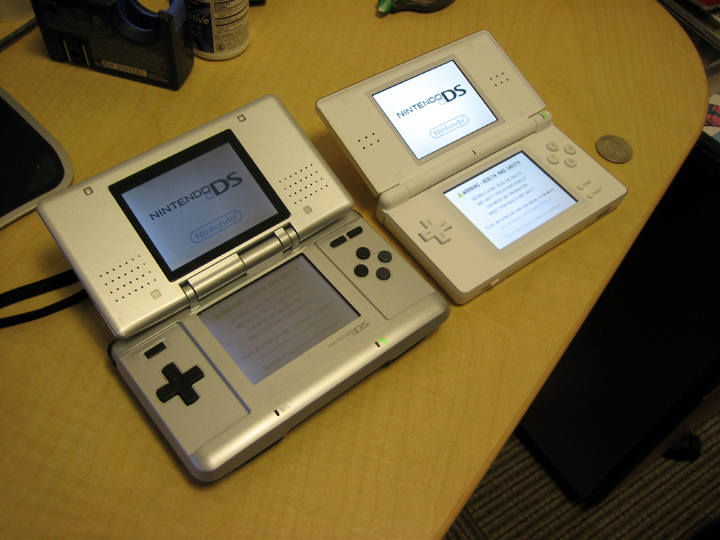 DS stands for Dual Screen. 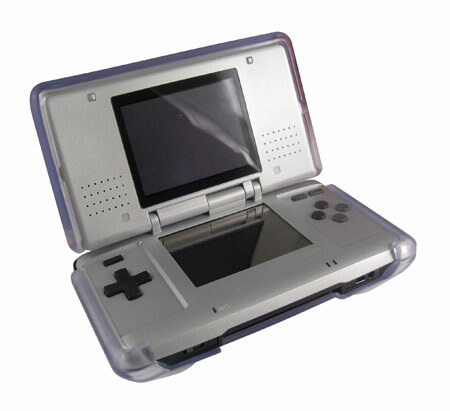 The Nintendo DS came out last year, and I remember thinking at the time, "what the heck do you need with two screens?" Well the main highlight comes from the fact that the bottom screen is also a touch screen. I have been pleasantly surprised by the innovation in gameplay that this has allowed. In Nintendogs you use the stylus to pet your dog, throw balls to play catch, etc. In Brain Age you play Sudoku just like on a piece of paper (without the eraser shavings). The Canvas Curse of Kirby is that his limbs have been removed and you move him around the screen by tapping him and enemies and with a rainbow of ink you make ramps and loops for him to move through. Metriod Prime: Hunters is a First Person Shooter unlike any ever seen on a console before because the stylus allows the control to be more like on a computer due to the way that it behaves a lot like a mouse. 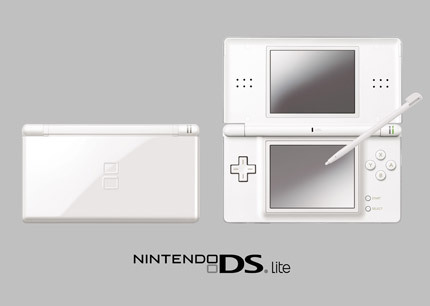 Even though I originally mocked it, and I still think the original DS was/is ugly, the DS Lite really is an innovative handheld gaming console. Another neat feature of the Nintendo DS is built-in wireless capability. When you are in the same room as other DS owners you can play games wirelessly with each other. And, if you the person you want to game with isn't in the same room, a lot of the games also can be played over the internet via a 802.11 wireless internet connection. There's even a microphone built into the DS and this feature is used in some games to allow you to talk to other people while you're playing a game over the internet. My favorite game so far has been the New Super Mario Bros. In gameplay, it reminds me a lot of the original Mario games (Super Mario Bros, and Super Mario Bros 3). Within a week of purchasing the game I had beaten it, and within another week I had done everything you could in the game (found all the secret levels and collected all the star coins). I took some time off before coming back and doing the same thing all over again with another save file. Another cool thing about the New Super Mario Bros is the included mini-games that are all controlled with the stylus and you can even play against up to 3 other people with DSs (they don't need the game). This started out as my new toy, but I now share custody of the device with Heather. Now, don't get me wrong, this isn't a bad thing. In fact, one of the main reasons I purchased Brain Age was so that she could play Sudoku. I enjoy it when Heather shares my interests, and this is no exception. If she plays her cards right, she may even get her own DS Lite for her birthday. It wouldn't just be a present for her, though, because it would result in me getting my DS Lite back. Also, we'd get to play games together via the wireless connection. 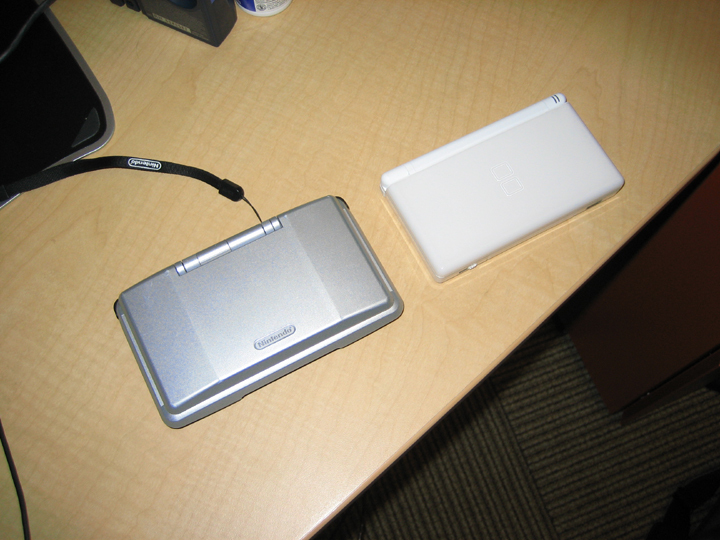 The DS Lite really is an impressive device and a big improvement over the original. I probably never would have bought the original DS; I thought it was ugly and big. The Lite is smaller, brighter, and overall a better designed handheld. As soon as I saw it I wanted it, and Jeff and I talked each other into buying one. With all of its accolades, there are a few things I don't like about the DS and they all have to do with the wirless communication. When you're in the same room as a person the wireless works great. However, the DS does not support WPA encryption, only WEP. As a result, I am unable to use the DS on my wireless network because I am running servers and sharing files across my network and I'm not willing to sacrifice my security. Luckily I have neighbors with open wireless networks... There are other workarounds, but I would prefer it if the DS would just support WPA encryption. My other issue is that in order to play with someone over the internet you have to exchange a "friend code" that is different for every game. This code is automatically exchanged if you play wirelessly with someone locally, but I would still prefer a better way of meeting up with other gamers. I think that Nintendo has really re-invented the market with their DS handheld, and they are looking to do the same with their new console coming out later this year, the Wii. Nintendo appears to be the only innovator in the gaming industry these days and I'm looking forward to just about everything they have on the horizon. They have always focused on gameplay instead of flashy graphics and I'm thinking that this vision will enable them to come out on top with this generation of gaming consoles. I suppose we’ll just have to wait and see.